The book, "Imagining Industan," appeals to the three nuclear armed powers sharing the Indus River basin — India, Pakistan and China — and Afghanistan to begin working together as never before to manage the precious resource. The book's 14 contributing experts acknowledge the immensity of the challenges in a region prone to political and military conflict but say "much greater collective planning is essential…if the Indus basin is to escape the likely disastrous consequences of continued failure to collaborate." The situation will only worsen as climate change threatens the resource and China and Afghanistan divert more of it for their own uses. Numerous new dams are planned or under construction in all four countries. "Industan" is a play on words to emphasize the need to think of the basin as a single, integrated resource. Making matters worse, the Indus basin is widely expected to be among the world's worst-affected from climate change, leading to drought, desertification, less predictable monsoon rains, weather turbulence, flooding, sea level rise, and glacial retreat — all with "potentially harmful collective economic and political consequences." Says UNU-INWEH Director Vladimir Smakhtin: "The book is an important contribution to creating the awareness of the existing and emerging water-related conflicts in the world, and a loud call for immediate strengthening of transboundary cooperation – to increase both water security and overall regional security. 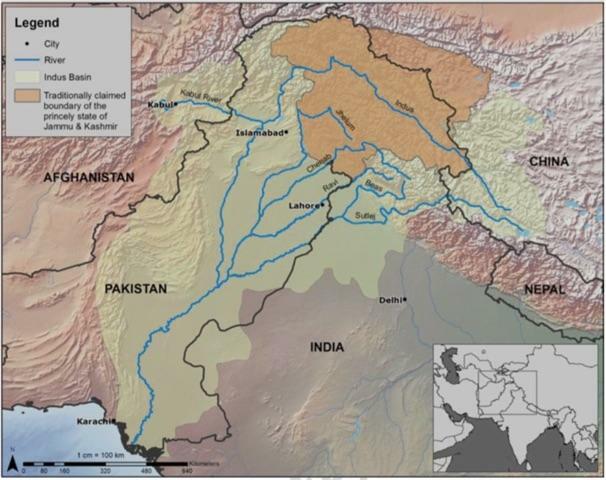 The Indus river basin may be seen as a water time bomb, which may go off any time with increasing water scarcity, variability and progressively changing climate. There are similar water-related accumulating tensions and issues in other major river basins and UNU-INWEH has embarked on the scrupulous analysis of those to ensure peaceful and sustainable trajectory of river basin developments." Views of the authors do not necessarily reflect those of the University. The UNU Institute for Water, Environment and Health is a member of the United Nations University family of organizations. It is a UN Think Tank on Water and its mission is to help resolve pressing water challenges of concern to the UN Member States through science synthesis, cutting edge research, application of on-the-ground science-based scalable solutions and targeted public outreach. It is supported by the Government of Canada and hosted by McMaster University.